Malkovich was born in Christopher, Illinois. His mother was of French, German, Scottish and English ancestry. He grew up in Benton, Illinois. His father, Daniel Leon Malkovich (1926–1980), was a state conservation director and publisher of Outdoor Illinois, a conservation magazine. His mother, Joe Anne (née Choisser; 1928–2009), owned the Benton Evening News, as well as Outdoor Illinois. Malkovich has three younger sisters and an older brother. His paternal grandparents were from Ozalj in Croatia, and according to his mother they were of Montenegrin ancestry. In 1996, Malkovich was directed for the second time (after Les liaisons Dangereuses) by Stephen Frears in Mary Reilly, a new adaptation of the Dr. Jekyll and Mr. Hyde tale, co-starring Julia Roberts Malkovich also appeared in Joan of Arc, directed by Luc Besson in 1999, playing the French king-to-be Charles VII. He made a cameo appearance in Adaptation. — also written by Kaufman — appearing as himself during the filming of Being John Malkovich. The Dancer Upstairs, Malkovich's directorial film debut, was released in 2002. In the same year he played Patricia Highsmith's anti-hero Tom Ripley in Ripley's Game, the second film adaptation of Highsmith's 1974 novel, the first being Wim Wenders' The American Friend starring Dennis Hopper as Ripley. . In 2002, at the Cambridge Union Society, when asked whom he would most like to fight to the death, Malkovich replied that he would "rather just shoot" journalist Robert Fisk and politician George Galloway, outspoken in their criticism and opposition of Israel and the then-imminent war in Iraq. ^ Stolyarova, Galina (March 31, 2006). "Prisoners of War". Moscow Times. Archived from the original on October 7, 2006. Retrieved December 22, 2008. ^ a b Wood, Gaby (September 30, 2001). "A multitude of Malkovich". The Guardian. London, UK. Retrieved December 22, 2008. ^ "Joe-Anne Malkovich obituary". Benton Evening News. March 24, 2009. Retrieved March 22, 2010. ^ "Daniel Ewing Malkovich, 59". The Randolph County Herald Tribune. Retrieved March 9, 2012. ^ "John Malkovich biography". TV Guide. ^ Telegraph Magazine (April 26, 2003). "Being John Malkovich". The Age. ^ Sophie Lam (March 20, 2015). "John Malkovich: My life in travel". The Independent. ^ "Croatian Art". Croatianhistory.net. September 2, 1995. Retrieved December 22, 2008. ^ Kralev, Nicholas (June 15, 2002). "Seeing John Malkovich" (reprint). NicholasKralev.com. Financial Times. Retrieved December 22, 2008. ^ "John Malkovich na Žumberku tražio svoje korijene". HRT Magazin (in English and Croatian). Hrvatska Radiotelevizija. October 6, 2017. Archived from the original (Video Interview) on October 6, 2017. Retrieved March 17, 2019. ^ "John Malkovich". imdb.com. Retrieved June 16, 2018. ^ a b "John Malkovich biography". Yahoo! Movies. Retrieved December 22, 2008. ^ "John Malkovich Emmy Nominated". Academy of Television Arts & Sciences. Retrieved March 9, 2012. ^ Eurochannel. "The Paradox of John Malkovich". Eurochannel: The European TV channel. Retrieved June 16, 2018. 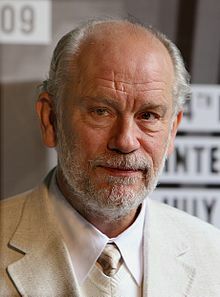 ^ Croatianhistory.net: John Malkovich; retrieved August 15, 2011. ^ Lane, Anthony (February 16, 2004). "The Creepiest". Vanity Fair. New York City: Condé Nast. Retrieved March 30, 2019. ^ "John Malkovich Trunk Show at The Royal Court Theatre". Royal Court Theatre. April 30, 2005. Retrieved March 9, 2012. ^ "John Malkovich and Flipping Uncle Kimono". International Press Clippings. Archived from the original on January 25, 2013. Retrieved January 28, 2013. ^ "John Malkovich launches clothing line for wealthy guys". New York Post. February 17, 2010. Retrieved March 9, 2012. ^ "John Malkovich: The Invisible Man". Boston Magazine. March 17, 2010. Archived from the original on January 6, 2012. Retrieved March 9, 2012. ^ "Los Angeles Stage - Seduction and Despair: Hearing John Malkovich - page 1". Retrieved June 16, 2018. ^ "Infernal Comedy Official Web Page". Retrieved May 28, 2012. ^ Creepy, Uncle (June 10, 2010). "Dozens of Images from Jonah Hex". Dread Central. Retrieved March 9, 2012. ^ Brown, Jonathan (June 10, 2011). "Malkovich and Pinter: an unlikely alliance". The Independent. Retrieved April 29, 2012. ^ "Julian Sands in a Celebration of Harold Pinter". The List. August 2011. Retrieved April 29, 2012. ^ "Les liaisons Dangereuses". Lesliaisonsdangereuses.fr. June 30, 2012. Retrieved January 24, 2014. ^ "Lincoln Center Festival - Jewels". lincolncenterfestival.org. Retrieved June 16, 2018. ^ "John Malkovich revealed as a playable Character in Cod:AW". Retrieved January 14, 2015. ^ Tonys World (February 6, 2017). "John Malkovich - Squarespace Super Bowl 2017 Commercial" – via YouTube. ^ Akbar, Arifa (January 8, 2011). "John Malkovich: 'I don't need to be liked'". The Independent. Retrieved May 12, 2015. ^ Barber, Lynn (July 9, 2006). "Life and taxes". The Guardian. Retrieved May 12, 2015. ^ a b Wood, Gaby (September 30, 2001). "A multitude of Malkovich". London, UK: Guardian. Retrieved April 25, 2010. ^ Ebert, Roger (September 30, 1984). "Chicago Has A Place In John Malkovich's Heart". Chicago Sun-Times. Retrieved July 20, 2015. ^ Barber, Lynn (September 7, 2006). "Life and taxes". The Guardian. London, UK. Retrieved July 14, 2011. ^ Kahn, Joseph P. (September 12, 2005). "Seeking John Malkovich". Boston Globe. Retrieved December 28, 2008. ^ Syson, Damon (June 8, 2015). "Aficionado: John Malkovich". The Daily Telegraph. ^ "Actor John Malkovich complains over Madoff fraud award". BBC News. April 3, 2010. Retrieved April 25, 2010. ^ Zambito, Thomas; Larry McShane (February 5, 2009). "Sandy Koufax, John Malkovich among Bernie Madoff victims as court filings are released". New York Daily News. Retrieved July 23, 2009. ^ Lyon, Jeff. "Malkovich Comes To Town For His One And Only Charity: Steppenwolf". Chicago Tribune. Retrieved August 7, 2013. ^ John Malkovich: 'I've read more books on the Middle East than any British journalist'. The Guardian. June 17, 2011. Event occurs at 5:40. Retrieved July 10, 2011. ^ Howell, Peter (September 11, 2008). "A Kinder, Gentler Malkovich". Toronto Star. Retrieved June 16, 2018. ^ "MP stunned at actor's outburst". BBC Online. May 4, 2002. Retrieved December 28, 2008. ^ "Malkovich: 'I'd rather shoot George Galloway'". Guardian Unlimited. May 7, 2002. Retrieved September 25, 2014. ^ Barnes, Henry (June 10, 2013). "John Malkovich 'saves the life' of pensioner after fall". The Guardian. Retrieved July 11, 2013. ^ Rivera, Zayda (June 10, 2013). "John Malkovich saves 77-year-old Jim Walpole after he falls, slits throat". NY Daily News. Retrieved July 11, 2013.